Weigh in results-WE ARE ON! Expected McMann to come in over again but she's just at the limit. She may look like a mann, but she is in fact a cann. I too thought she'd come in mad fat. To all those who are going to the London show tomorrow enjoy, it should be good! I like how they do things like the open workouts too for the public, it's like they make a whole weekend of it which is great! I do wonder how Nathanial Wood will do also, hearing his story with Brad Pickett too is great. 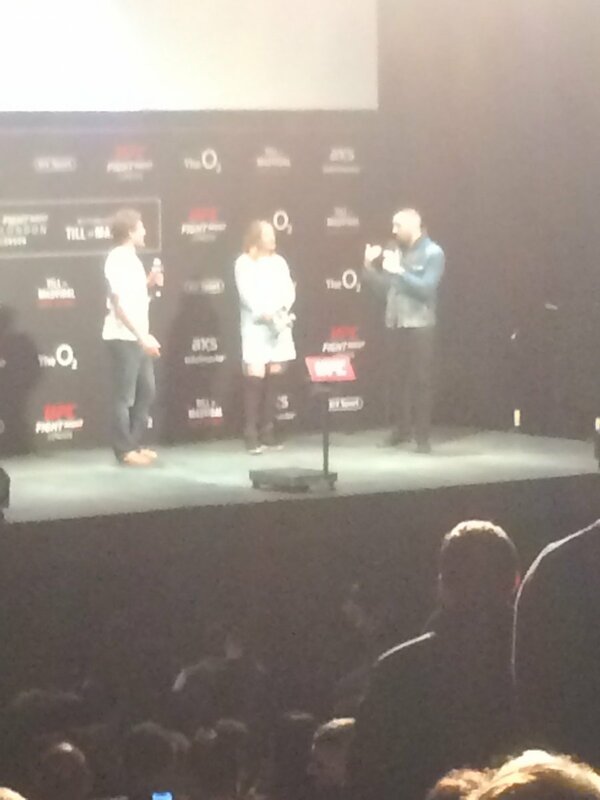 Askren is there and has bumped into Till. Going with both Nicolae﻿ Negumereanu﻿ and his opponent Saparbeg ﻿﻿Safarov. 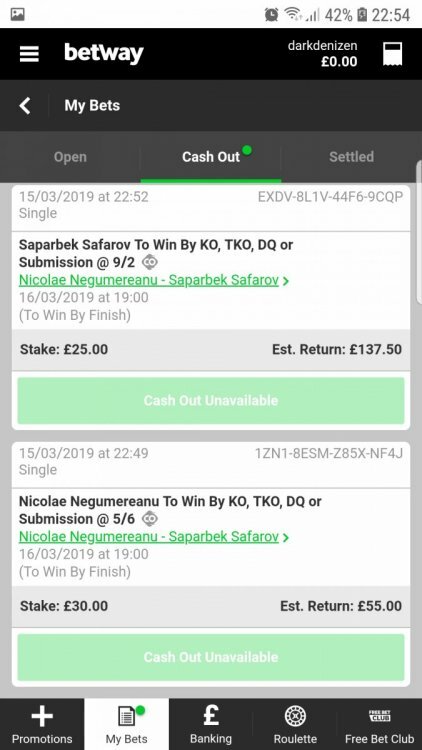 backing each fighter to win by KO comes in at roughly +165. That's crazy, neither guy has seen the 3rd round in their pro career. 12 wins by KO and 5 by sub between them. +165 by KO for either is free money. A fractional added to cover the stake in the unlikely event that it goes the distance. Only a draw or submission can fùck me, any other out come is BANK. Ben Askren's predicitions for tomorrow night. Did anybody stay behind and get pics with Ben Askren and Jojo? That aside, it's good and props to Ben for the way he handles it, I think it's a case of the crowd love him really and since coming to London he's been causing a lot of waves and he's not even fighting on the card, it's like he's been the star of the show so far. Here is some totally free money for you guys all you need to do is download a gambling app that will pay you one free bet to sign up. I used my sign up bonus on the fight going to a decision, as can be seen in the screenshots. If you can do the math, you can see that it's literally free money except in case of a draw. Beyond that, the very worst thing that can happen is, I win my money back. Uh...do the math. I thought you were a gambler? If it goes to a draw I'm £27.50 In profit. 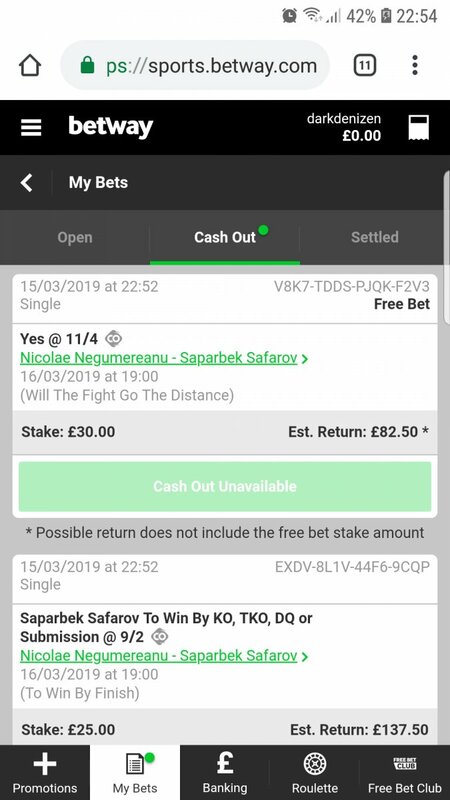 The screen shot shows 11/4 by decision which would be £112.50 but instead it shows £82.50 (-£30)because they won't return the free bet as it's not mine, it's theirs. The £82.50 is mine to withdraw at my discretion, not theirs. It's free money like I said. Take it or leave it. But don't come acting like you know better than me. Clearly you don't. It's free money like I said. If it's so ****ing free, why are you risking fake bonus money that you have to make 5,000 times the starting amount to cash out, and then $40 or so of your money? Or is that all the money you have to your name? Not sure I understand. But yes I exploit the greed of bookmakers to get new customers. You can easily look into it your self. Sports free bets don't need to be gambled multiple times, you can cash them whenever. Casino bets (from previous thread) need to be reinvested, I think the last one I had to turn over $500 from $10 before it would release the funds. You're actually in a much better position to exploit the system than I am because there's dozens of companies in the US which will match your sign up bets to a much higher value. The reason the bet above is limited to £30 is because that is where that particular company cap their free bets. You are in a position to do the same thing but you could be betting much more money and having a far greater ROI because of the deals US bookmakers offer to new customers. The bets which are shown above are as legitimate as it gets. Look into it yourself. Get a pen and paper out, do the maths, you'll see it works. Actually, internet sports betting is ILLEGAL in America. You can use betting apps for specific casinos in particular states, but only while in said state. It literally cuts you off at the border. What you said before that is the free bet you're making has to turn over 50x what you are given. On Bovada, I'm pretty sure it's 100x (1000%). But suppose the fight you're betting on goes to decision, you're 20% of the way to cashing out $500, and you donated 75% of the money you gained (fake money) in real money out of your pocket. You misread. The casino bonus that o posted the other day, I needed to roll over 40 times or whatever. I actually joined that site to get daily free bets for the Cheltenham festival (horse racing). The £10 casino bonus I was given along with it was just gravy, I could care less about casinos for the most part. The bet above: if it's the decision that comes in the figure posted will be real and fully accessible immediately. I don't want a decision of course, but only because Safarov pays much better profit. It's a 99% guaranteed no loss bet. Can you just bump the Bovada thread with all of this or create your own thread to talk about it? You drown out any discussion with this attention wh0ring routine. It's was literally asked for, so I posted it, you being you, attacked it. All depends on how much fake, non-withdrawable money they allow him to play with this time. You best believe we're going to be swimming in screenshots of stupid chit though. 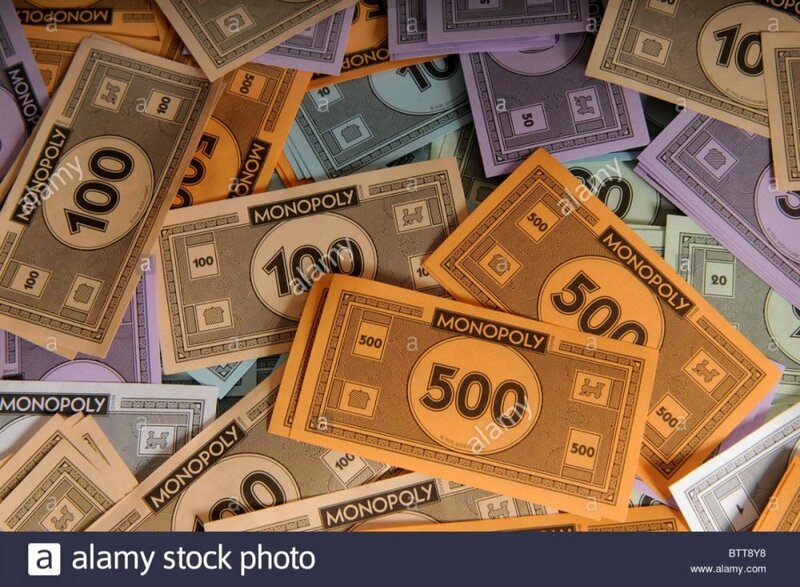 Just wait till he calls you a **** and shows you a picture of his big Monopoly win hes been saving up. The cash stacks will be huge. 5dimes, betonline, and sportsbetting.ag are all the same as well. Their "free" money is a sucka bet to rope you into betting more. If you're a sucker then you're gonna lose. If you're not you're gonna break even or win. Tried to give you guys a chance at free money, show you how easy it is to exploit the system the bookmakers use. Ben Askren and Dan Hardy are going live on Facebook in an hour if anyone wants to watch, it's on the UFC page (not sure if it's the UK UFC page so check but you'll see the reminder there). Link, 10 mins they go live. Edit: Not sure if it's pre-recorded and the video goes live in 10 mins but either way, should be good. It's telling how you see it one way, and then literally everyone else sees it another way. Likely a recurring theme in your life. But good luck anyways. Looks to me like you're going to donate money over and over until you cash out the bonus money, which will inevitably just be your own money that you lost being returned. I never accept bonuses or any promotion from the books. If I deposit and they throw one on there without my permission I live chat and specifically tell them to take it off. I want no catches when comes time to withdraw where I gotta turn the money over 10x to do what I want with it because even though you may win with bonus money it's not your cash to do as you please until you roll it over. Tom Breese is out due to health issues. I was just wondering too, how do you guys honestly think it'll go between Till and Masvidal? I honestly feel it'll be Till in regards to this who will get it but Masvidal seems to be either written off by people (definitive Till win) or others are saying Masvidal will beat him so I was wondering what you guys think? Personally, I think it'll be Till, he just seems to have the advantage but it won't be an easy fight for him though I reckon, so how do you guys HONESTLY feel this whole Masvidal/Till thing will go? This is the third fight in a row Breese has pulled out of now. card still starts at 1 or 1:30 now that breese is out? I'm not sure, from what I can gather it's still the same as the events been going on a while, still same schedule on BT Sport but I know that's gonna say that anyway. My guess is just that the main event will start earlier (20 mins max) as they usually just fill up the remaining time slot with a UFC programme or something when the events finish earlier than the listings. Very strange line movement in this fight. Is the fix in? Whole Alpha Male camp is getting concussed. Which channels are showing the fights in England?? Is this the same chick that Mario Yamusaki almost let die vs Valentina? Meatball shooting for her life after the 1st exchange. 2 soccer moms fighting in the UFC.